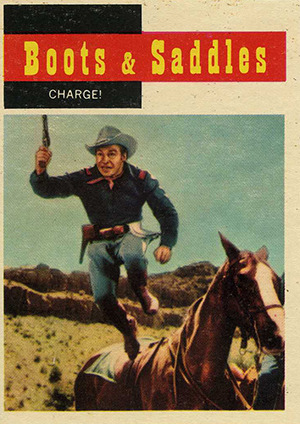 1958 Topps TV Westerns trading cards is a rare set that manages to combine content from nearly a dozen different shows. This is something collectors could only dream about today. Released around the peak of popularity of the Western genre, the set was wildly popular when it was first released and still resonates with collectors today. The number of cards isn't consistent from series to series. Most have five or six, although this dips to a low of three for The Californians. 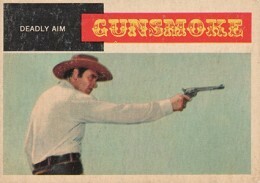 Gunsmoke, one of the most iconic Westerns, kicks off the set with 15 cards. 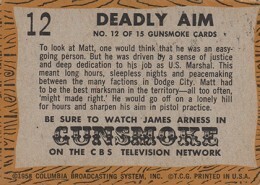 Cards focus primarily on action from the show as well as showcasing lead stars. And while Wanted: Dead or Alive wasn't the most popular set, the cards here do spotlight acting legend Steve McQueen. Measuring 2.5" by 3.5", the card design is very distinct. On the front, a large red box has the show's name. It's overlapping a black box with the card's caption. A colorful show photo is underneath. 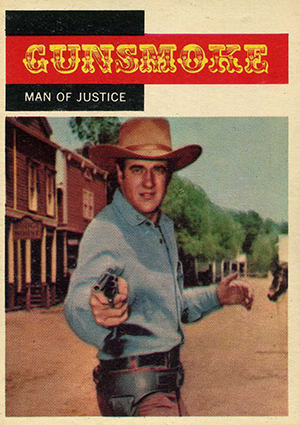 1958 Topps TV Westerns card backs have a drawn wood grain background with a white box over top. This includes both the card number as well as a second number based on the total number of cards for that particular show. For fans of specific shows, this makes it easier to build a full run of a particular subset. There's also a writeup and an ad for the show at the bottom. One of the most iconic entertainment sets of the 1950s, 1958 Topps TV Westerns is still readily available. This makes building sets a challenge but certainly feasible. 1958 Topps TV Westerns; (3Cards); #4; 38; 65; EX NM. I recall how no one I knew could ever find one of the ‘Wagon Train’ cards; we had to find friends and relatives elsewhere in Ontario to trade! Most of the collection has survived untold numbers of moves around the world and now I would like to complete the set, replacing a few that have gone missing. I am looking for: 5, 30, 40, 51, 67. I have duplicates of: 4, 6, 12, 13, 15, 38, 44, 52, 56. All of the cards in my collection were used, of course. We wold play before school, at recess, at lunch, after school . . . the most popular game, as I recall, was knocking down popular cards leaning at the base of a wall. As a result, corners were quickly softened! Am not interested in Mint cards, just some to complete the set.